Gen. Martin Dempsey at the Defense One Summit on Wednesday. 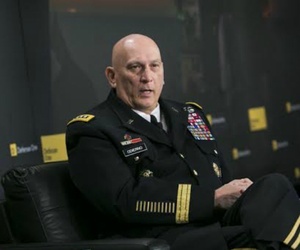 The nation’s top military officer told an audience at the Defense One Summit in Washington that the U.S. strategy in Iraq and Syria is sound but like any good one, it’s likely to change - and regularly. Joint Chiefs Chairman Gen. Martin Dempsey, who returned from the Middle East on Sunday, said he was “encouraged” by what he saw during his trip to Baghdad. But amid concerns that the Obama administration lacks a coherent war strategy or is scrambling to build a better one against the Islamic State, Dempsey said the U.S. has a solid strategy but it will adapt accordingly. For now, it’s sound. Dempsey met with senior Iraqi political and military leaders. “I was encouraged, but I’m also pragmatic,” he said. The Iraqi leadership, he said, is more inclusive and is cognizant of many of the things it must do to degrade the Islamic State. But the new leaders inherited “deep structural disadvantages” and they’ll need “courage, luck and leadership” to overcome them, Dempsey said. The recent removal of a number of military commanders from the Iraqi Security Forces who were seen as too politically influenced to be effective is a good sign. More Iraqi commanders will be replaced soon, he said, but the U.S. is not vetting them for the Iraqis – that is on Iraqi leaders. 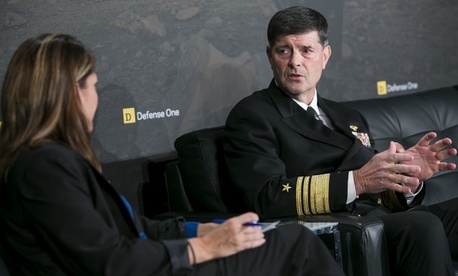 “They are not through with that reorganization,” Dempsey said. Dempsey spoke on a range of issues, from the strategy in Iraq and Syria to the budget to the military’s relationship to Congress and the American public. 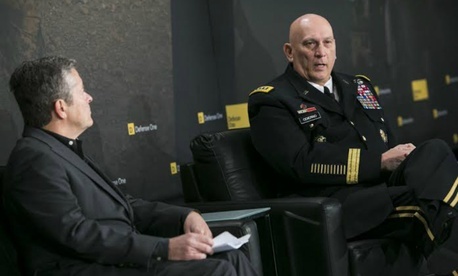 The chairman spoke broadly to the array of world crises that dominates the Pentagon’s attention and addressed how the U.S. military should be trained and equipped for those myriad challenges. But he noted that one of the most limiting factors to doing that effectively is the Pentagon’s budget. Not only does the Pentagon need more money than current funding proposals request – Congress must get out of the way when it comes to the uncertainty of the budget process. Asked if he needed more money for the Pentagon for the many missions the Pentagon has been asked to conduct, Dempsey was direct. A year ago, he pointed out, Russia had not annexed Crimea, the Ebola virus was not a global concern, and the Islamic State had not established itself as an effective force burning across the Middle East. All these will require new thinking about how much money the Pentagon will need. Dempsey said the budget needs to be more than the $535 billion proposed for 2016 in its 2015 budget request, which itself is already $35 billion over the Budget Control Act cap. 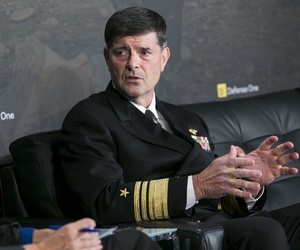 “We need additional topline for emerging and additional requirements,” Dempsey said, referring to the baseline budget number. That will require the Pentagon to reach out effectively to Congress to convince members not only that the Defense Department needs more money, but that it must begin to operate under a new set of rules than the current budgetary deadlock allows. Dempsey was critical of himself, saying the Pentagon needs to do a better job of explaining to Congress why the issue is critical. Over the last couple years, the Pentagon has cast the argument first as one of risk, then one of readiness. Neither argument resonated, he said. “I’ve failed on two counts,” he said. “Frankly, I’m trying to decide for myself how to adapt my narrative,” he said. But ultimately, the American public must understand that it’s all about options – and speed, he said. For example, the U.S. military deployed forces to West Africa in two weeks. But without being properly resourced, that kind of deployment in the future could take as much as six months, he speculated. And that is probably not what the nation expects of its military.